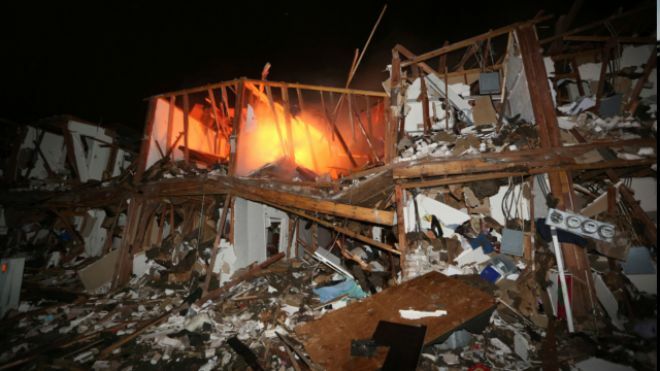 Police say between 5 to 15 people were killed and more than 160 were injured in a massive explosion at a fertilizer plant near Waco, Texas, late Wednesday. 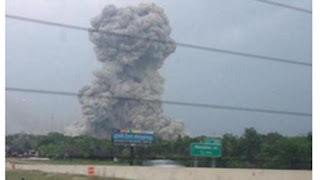 The explosion at West Fertilizer in downtown West — a community of roughly 2,600 residents about 20 miles north of Waco — happened around 8 p.m. and could be heard as far away as Waxahachie, a town located 45 miles north. It sent flames spiraling high into the evening sky and rained burning embers, shrapnel and debris down on frightened residents. "At some point this will turn into a recovery operation, but at this point, we are still in search and rescue." A member of the city council, Al Vanek, said a four-block area around the explosion was "totally decimated." Other witnesses compared the scene to that of the 1995 Oklahoma City bombing and authorities said the plant made materials similar to that used to fuel the bomb that tore apart that city's Murrah Federal Building. Debby Marak told The Associated Press that she noticed a lot of smoke in the area across town near the plant when she finished teaching her religion class Wednesday. She said she drove over to see what was happening, and that when she got there, two boys came running toward her screaming that the authorities had ordered everyone out because the plant was going to explode. She drove only about a block when it did. "It was like being in a tornado," Marak, 58, said during a phone interview. "Stuff was flying everywhere. It blew out my windshield. It was like the whole earth shook." Marak called her husband and asked him to come get her. When they got to their home about two miles south of town, her husband told her what he'd seen: a huge fireball that rose like "a mushroom cloud." The USGS reported that the blast registered a magnitude 2.1, which is comparable to a minor earthquake. "They are still getting injured folks out and they are evacuating people from their homes," Waco Police Department Sgt. William Patrick Swanton said early Thursday. He added later: "At some point this will turn into a recovery operation, but at this point, we are still in search and rescue." Gov. Rick Perry will hold a press conference on the incident at 11:45 local time, Swanton said. 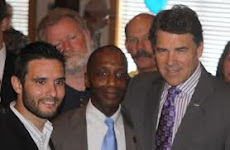 In a statement released Wednesday, Perry said his "thoughts and prayers" were with West residents and first responders. Swanton said authorities believe that between 5 and 15 people were killed in the blast, but stressed that's an early estimate as search and rescue operations remain under way. There is no indication the blast was anything other than an industrial accident, he said. At least three firefighters are still missing. The still-smoldering fire was "somewhat under control" by early Thursday, Swanton said, adding that authorities were not concerned about lingering smoke. Swanton said a "small amount of looting" has occurred near the blast site, but he did not provide additional details. He said looters are a "significant concern" to authorities and that at least one person suspected of being a looter was spotting running from a damaged home. "The town is secure," Swanton added. A weather front is bringing cooler temperatures and thunderstorms into the area. The National Weather Service in Fort Worth said thunderstorms are expected to affect West until about 9 a.m. Thursday, though lightning should become less frequent gradually. Temperatures are dropping into the low 50s. The U.S. Bureau of Alcohol, Tobacco, Firearms and Explosives is sending a national response team to the site. ATF spokeswoman Franceska Perot said Thursday the unit includes fire investigators, explosives experts, chemists and canine units. West Mayor Tommy Muska, who is also a volunteer firefighter, did not answer questions about his fellow firefighters, but said: "I ask for your prayers." A search for survivors continued throughout the night, as emergency workers went house to house and business to business looking for people trapped in the rubble. "We've got a lot of people who are hurt, and there's a lot of people, I'm sure, who aren't gonna be here tomorrow," Muska said. "We're gonna search for everybody. We're gonna make sure everybody's accounted for. That's the most important thing right now." The town's volunteer firefighters responded to a call at the plant about 6 p.m., Swanton said. Muska was among them, and he and his colleagues were working to evacuate the area around the plant when the blast followed about 50 minutes later. Muska said it knocked off his fire helmet and blew out the doors and windows of his nearby home. The main fire was under control as of 11 p.m., Texas Department of Public Safety spokesman D.L. Wilson said, but residents were urged to remain indoors because of the threat of new explosions or leaks of ammonia from the plant's ruins. Dozens of emergency vehicles amassed at the scene in the hours after the blast, as fires continued to smolder in the ruins of the plant and in several surrounding buildings. Aerial footage showed injured people being treated on the flood-lit football field that had been turned into a staging area. Vanek said first-responders treated victims at about half a dozen sites, and he saw several injured residents from the nursing home being treated at the community center. Swanton said early Thursday morning the injured were being taken to hospitals in Waco and a triage center at high school in nearby Abbott. A spokesman at Hillcrest Baptist Medical Center in Waco told The Associated Press the facility received 98 patients, including the five in intensive care. Another 30 have serious injuries, including orthopedic and head trauma. Providence Health Center in Waco treated 65 patients from the explosion, admitting 12. A spokeswoman says those patients had broken bones, cuts, head injuries, minor burns and some breathing problems. Two patients were also being treated at Parkland Hospital in Dallas. MyFoxDFW.com reports as many as 300 people were taken away from the scene with injuries. Roughly 133 patients, including some in wheelchairs, were evacuated from the West Rest Haven Nursing Home, which was among the damaged buildings. Up to 75 homes were also damaged, as well as an apartment complex with about 50 units that was reduced to a "skeleton," Wilson said. Erick Perez, 21, of West, was playing basketball at a nearby school when the fire started. He and his friends thought nothing of it at first, but about a half-hour later, the smoke changed color. The blast threw him, his nephew and others to the ground and showered the area with hot embers, shrapnel and debris. "The explosion was like nothing I've ever seen before," Perez said. "This town is hurt really bad." The explosion knocked out power and could be heard and felt for miles around. Lydia Zimmerman told KWTX-TV that she, her husband and daughter were in their garden in Bynum — 13 miles from West — when they heard multiple blasts. "It sounded like three bombs going off very close to us," she said. Lucy Nashed, a spokesman for Perry's office, said personnel from several agencies were en route to West or already there, including the Texas Commission for Environmental Quality, the state's emergency management department and an incident management team. Also responding is the state's top urban search and rescue team, the state health department and mobile medical units. The U.S. Chemical Safety Board said it was deploying a large investigation team to West. American Red Cross crews from across Texas also headed to the scene. Red Cross spokeswoman Anita Foster said the group was working with emergency management officials in West to find a safe shelter for residents displaced from their homes. Swanton said he had no details on the number of people who work at the plant, which was cited by the Texas Commission on Environmental Quality in 2006 for failing to obtain or to qualify for a permit. The agency acted after receiving a complaint in June of that year of a strong ammonia smell. In 2001, an explosion at a chemical and fertilizer plant killed 31 people and injured more than 2,000 in Toulouse, France. The blast occurred in a hangar containing 300 tons of ammonium nitrate, which can be used for both fertilizer and explosives. The explosion came 10 days after the Sept. 11, 2001, terrorist attacks in the U.S., and raised fears at the time it was linked. A 2006 report blamed the blast on negligence. President Obama, in a statement released Thursday, thanked first responders in the "tight-knit" Texas community. "I want to thank the first responders who worked tirelessly through the night to contain the situation and treat the wounded," the statement read. "My Administration, through FEMA and other agencies, is in close contact with our state and local partners on the ground to make sure there are no unmet needs as search and rescue and response operations continue. West is a town that many Texans hold near and dear to their hearts, and as residents continue to respond to this tragedy, they will have the support of the American people." Click for more from MYFoxDFW.com. Click for more from FOX17. Click for more from KWTX. Fox News' Todd Starnes, Joshua Rhett Miller and The Associated Press and Reuters contributed to this report. Online games provide great benefits.